Hunting Information - At Boggy Creek Outfitters, we have over 600 acres under management for traditional hunts. We also have a 40-acre high fence facility which can be stocked with whatever game tickles your fancy. Guides are available at no additional charge. Guides can clean and quarter your game for you for a fee paid directly to the guide. If you want to take your game home bring coolers, ice is provided. Contacts for meat processing can be provided. Don’t want to take your kills home but don’t want it to go to waste? There are several places that will take your kills as a donation to feed those less fortunate. All prices include use of our hunting cabin at no additional charge. Facility can sleep 9 to 11 people if you are real friendly. This is RUSTIC hunting camp cabin. It’s dry, has hot and cold running water, and has plenty of room to spread out after a long day of hunting. Bring your own food and drinks. Meals can be provided for a fee. Our hunters have a 70% success rate overall. We put you on the game. It’s up to you to finish the job! Whitetail deer hunts - $250 per day, per person - several deer stands with feeders and food plots are available. Hog hunts with dogs - $450 per day and includes up to 3 people. Duck Hunts - $150 per day per person. Turkey Hunts - $150 per day per person. Dove Hunts - $50 per day per person. Squirrel / Small Game - $50 per day per person. Predator Hunts - $50 per per day per person. Guides are provided at no charge. Guides can clean and quarter your kills for a fee paid directly to the guide. 2 hogs of less than 100 pounds per person, hunters pay $2 per pound for everything over 100 pounds. For example, 100 pound hog would be no additional charge. A 145-pound hog would have the first 100 pounds included and the 45 pounds over would be $2 per pound = $90. Hog Hunts - $200 per day per person. 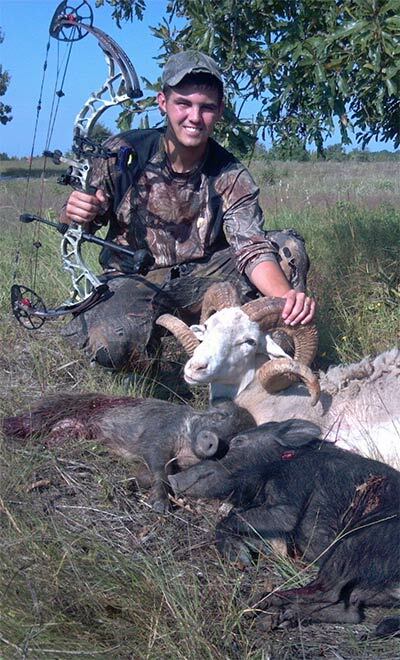 Ram / Hog Combo - $500 per day per person for a NON-Trophy Ram. Trophy Ram / Hog Combo - $800 per day per person for a Trophy Ram. Exotics - Call for pricing. We can get just about anything you may want to hunt. Please use our contact us page for our details. Need anymore Hunting Information? Just visit our Contact US page and give us a call!